1. Preheat the oven to 220˚C, gas mark 7. Toss the fennel with 1 tbsp oil in a roasting tin then spread out. Put the fish on top, drizzle with another tbsp oil and season. Roast for 12-15 minutes, until thoroughly cooked. 2. Finely grate all the citrus zest into a bowl. Peel, then segment the orange and grapefruit over the top to catch the juices, add the segments. Mix in the juice of half the lemon and remaining oil then season. 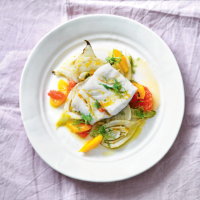 Serve the cod, then mix the dressing through the fennel in the tray, scatter with fennel fronds before spooning alongside.